Fiji is an island country between New Zealand and Hawaii, so as you can imagine — it’s a pretty beautiful place. It’s sunny and temperate most of the year, and there are so many interesting things to see. There is one place that many people pass by, however: Nadi (pronounced Nan-di). Nadi is the second largest city in Fiji, after the capital Suva. It is on Viti Levi, the largest island in the country. Many people travel through Nadi on their way to other smaller destinations, but I’ve discovered a few hidden treasures that are worth checking out. 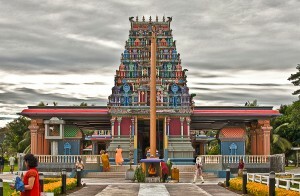 One of the most remarkable things in Nadi is also the most unexpected: a Hindu Temple! Sri Siva Subramaniya was built in 1976, and it is the largest Hindu temple in the Southern Hemisphere. Fiji has a large ethnically Indian population who came to the country in the 18- and 1900s to work in sugar plantations. Take a walk around Suva and Nadi, and you’ll see lots of signs written in Hindi (that’s one of the main languages of India). 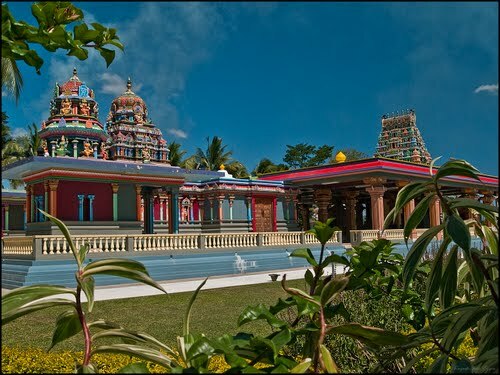 Nadi’s Hindu Temple is hard to miss — its bright colours stand out against the lush greens of the city. It is built in a style called Dravidian, which comes from Southern India. At the centre of the temple is a tall Koil, a pyramid-like structure. Many of the granite sculptures of gods that you will see were shipped all the way from India! The temple is dedicated to Lord Murukan, who is the god of nature. The people who worship there are very respectful of nature. In fact, you’re not allowed to go inside if you’ve eaten any meat that day — so stock up on the fruit and vegetables before you head out. Throughout the year, there are many celebrations that take place at the Temple. Some last for days, with dancing, eating and praying all through the night. Visitors are welcome to take part, as long as they are dressed and act moderately. You won’t want to miss this unique experience! To learn more about the festivals at Sri Siva Subramaniya, visit Fijime.